A Tank, An Organ And Smart Power: Allora & Calzadilla At The Venice Biennale's U.S. Pavilion The Venice Biennale opens to the general public on June 4. And this Biennale's American Pavilion — created by artists Jennifer Allora and Guillermo Calzadilla — might raise a few eyebrows. It features an overturned tank topped by a U.S. Olympic athlete on a treadmill. 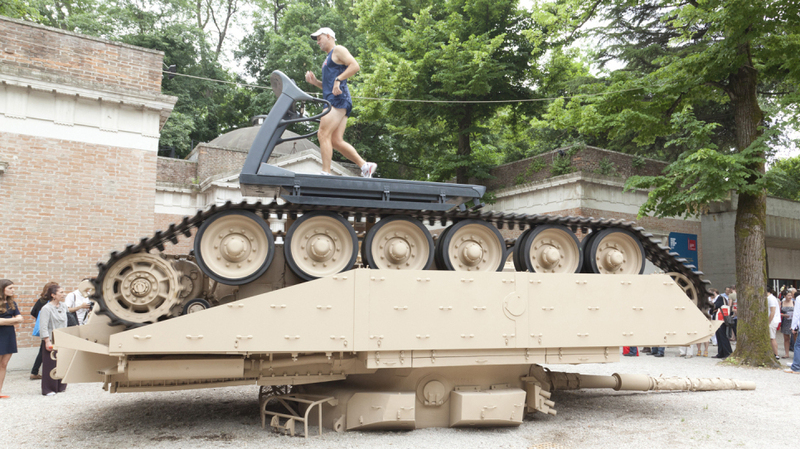 Former Olympian Gary Morgan runs on a treadmill atop an overturned tank in Track and Field, by Jennifer Allora and Guillermo Calzadilla. The piece is part of the American Pavilion at the Venice Biennale. For more than 100 years, artists from around the world have gone to Italy to represent their countries in the Venice Biennale — an event that's often called the Olympics of the art world. Like athletes, they prepare rigorously and eventually compete for the gold (actually the Golden Lion — the Biennale's top prize) on an international stage. This year, the exhibition opens to the public on June 4, and artists are scrambling right up to the last minute to put the finishing touches on their exhibitions. There's a lot of dust in the air outside the pavilions — and with all of the cardboard and debris lying around it kind of feels like a war zone. So, when you get to the American Pavilion and see a 60-ton British tank turned upside down, it almost looks normal. 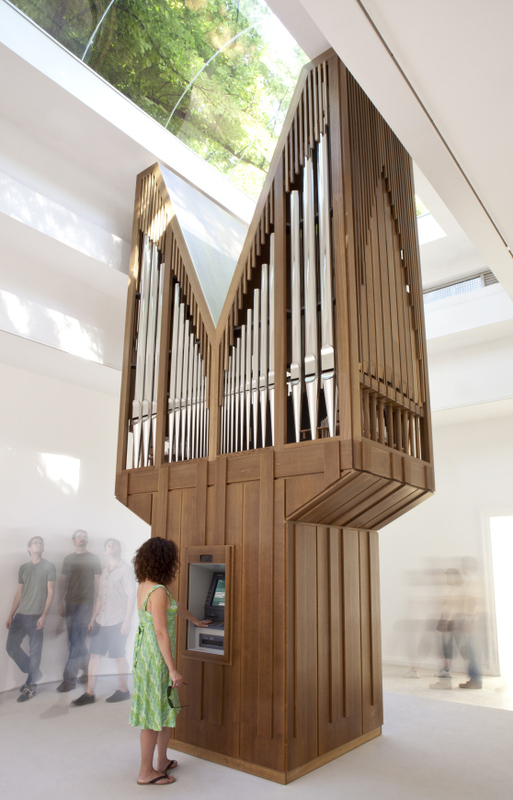 For the installation Algorithm, Allora & Calzadilla rigged a pipe together with a working ATM; the organ only plays music when a transaction is made. "The market for tanks is limited," says American artist Jennifer Allora, chuckling, "and the American tank, which was our first choice — the Abrams — was not available right now for nonmilitary consumption." Allora and her partner, Guillermo Calzadilla, are representing the U.S. with five installations. For this one, called Track and Field, they've fixed an exercise treadmill on top of the tank's right track — where a real U.S. Olympic athlete jogs in 30-minute stretches. He's one of eight Olympians performing through November when the Biennale closes. Another installation is called Algorithm. It invites the viewer to become the performer — specifically, on a 20-foot-tall wooden pipe organ. Only there are no keys, knobs or pedals. In their place is a functioning ATM. You activate the music with your bank card. Calzadilla demonstrates by entering his PIN, withdrawing 60 euros and collecting his receipt — and the organ plays him a tune. The experience is majestically profane and destined for controversy, just as works from such past Biennale artists as Jackson Pollock, Robert Rauschenberg and Jasper Johns were in their day. The exhibit by Allora and Calzadilla, comprising the five installations, is called Gloria, which translates to "glory" in English — as in Olympic glory, or the glory of art, or the glory of war. But an overturned tank can easily be interpreted as a symbol of America's faded glory. "A lot of people asked us, 'Did the U.S. government know what they were getting when they chose Allora and Calzadilla?' " says Lisa Freiman, who curated the American Pavilion. "And I said, 'Yeah! They knew everything! Every dirty detail.' So it's been an interesting experiment in transparency and it seems to have worked." The U.S. State Department ultimately chooses who will represent the United States. David Mees, the U.S. cultural attache in Rome, believes that Gloria offers more than just shock value. It's actually an example of an underrated tool of foreign policy, he says — something the administration refers to as "soft diplomacy." Jennifer Allora and Guillermo Calzadilla outside the U.S. Pavilion at the Venice Biennale. "So often we go to our international partners and say, 'Hey we want this from you on trade policy,' or, 'We want you to stand with us in Afghanistan.' And we often are not very popular when it comes to our regular foreign policies. So it's very important also to cultivate that softer image — what the Obama administration has called 'smart power.' "
"Smart power" won the U.S. a Golden Lion at the last Biennale, thanks to Bruce Nauman's wax heads and soft neons. This year, Allora and Calzadilla hope the judges will grasp the complexity of their work. "You can see the relationship between militarism, obviously," says Calzadilla, "and you can think about the war. But also you can think about sculpture; you can think about gravity, weight, assemblage, performance, sound. So it has all these sort of multiple registers that make it exceed one single, useful, practical, functional end." Whether or not the judges get it, the artists are at least guaranteed to take home plenty of ATM receipts.